The Colorado Avalanche witnessed goaltender Pavel Francouz make a case for his future NHL career with 29:15 minutes of ice time for the team Saturday night. It was a small sample size, just under half of a single game, but it was impressive. He entered the net when the chips were down and the Avalanche looked flatter than a pancake. Francouz rose to the challenge and helped spur a third-period resurgence. 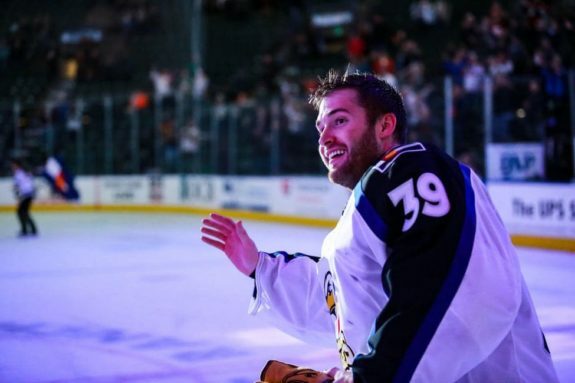 For those who don’t know Francouz, he’s been the starting goaltender for the Colorado Eagles this season (the Avalanche’s AHL affiliate), the starting netminder for the national Czech team and has played in the KHL for three years where he was named an All-Star. He was acquired by the Avalanche in the offseason. He played well in preseason but the Avalanche already had two NHL starters backstopping the team. Francouz also had some things to learn about the North American game. 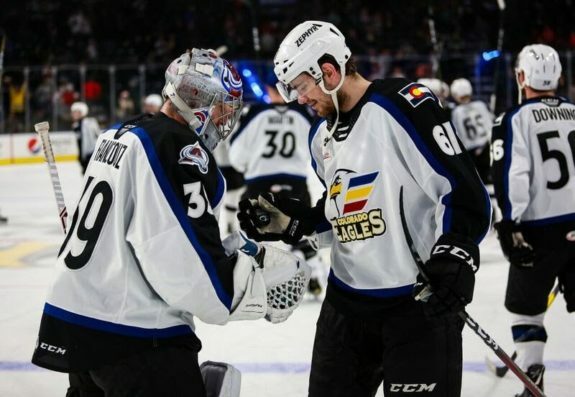 He became the starter for the Colorado Eagles and started making a name for himself. When I spoke with him, the six-foot-one goaltender spoke English fluently and easily. He was both polite and forthcoming. For a man who had championed his Czech team to the 2017 World Championship Semi-Final (losing to Russia) and had also led his KHL team to the Conference Final, he was surprisingly approachable. Francouz outlined what he considered to be the biggest shift from European to North American hockey. Francouz has earned a 13-5-2 record, a .921 save percentage (SV%) and allowed an average of 2.61 goals per game (GAA) playing for the Eagles this season. For context, the Eagles have played 28 games and own a 15-9-3 record. A sharp-eyed reader will notice the Eagles only garnered two additional wins over eight games without Francouz in net. 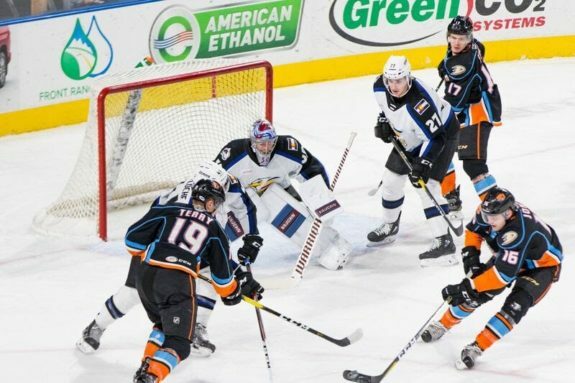 Francouz ranks third in SV% among AHL goaltenders and ninth for GAA, having played more games than any of the players ranked above him in either category. And remember, it’s the Eagles’ first year in the AHL. While Francouz didn’t help the Avalanche win, he did prove he could handle himself under pressure and bring forth a solid performance in net. He also exhibited grace under pressure. Nothing went as planned Saturday. He woke up Saturday morning unaware he would be flying down to fill the backup role for the Avalanche. 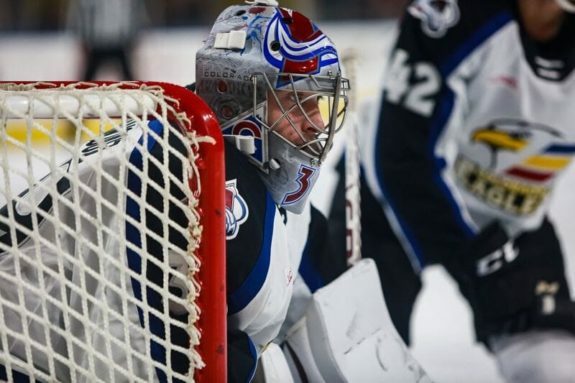 However, scheduled starter Semyon Varlamov became ill, forcing a lineup change. Phillip Grubauer was going to have to start after a strong performance Friday night and Francouz would suit up in a backup role. The Avalanche played flat and uninspired hockey in the first half of their matchup against the Coyotes – a team near the bottom of the standings. Grubauer struggled to offset his teammates’ defensive lapses. He was gamely pushing through the second period of an unexpected back-to-back contest. After the Avalanche surrendered their fourth goal, Bednar elected to send in Francouz, hoping to shake up the team and spur some offense. 46 seconds into Francouz’s first NHL appearance, the Avalanche got a cross-checking penalty and the trial by fire began in earnest. The team – and Francouz – managed to successfully kill the short-handed situation and stopped the bleeding. The Coyotes were shut out the rest of the period. Then, Avalanche captain Gabriel Landeskog sparked a comeback in the third frame. The team tied it up before the Coyotes’ Brad Richardson managed to sneak a puck through Colorado defenseman Ian Cole’s legs and into the net. Francouz never even saw it. The Avalanche comeback fell short. Despite the loss, Francouz showed up big in the net. He stopped 21 of 22 shots in his 29 minutes of play, earning a .955 save % and shutting out the Coyotes on two penalty kills. He withstood a flurry of Arizona shots in the third period as Arizona threw 18 pucks on net. He credited both the Colorado Avalanche and the Colorado Eagles staff with helping improve his game. Francouz and his wife have adapted well to being in the United States. As for where he sees himself next season? Francouz answered humbly. But his helmet may offer a better glimpse of his true heart. Both Colorado Eagles and Colorado Avalanche symbols cover his bucket, set against an Avalanche color themed background. He appeared genuinely appreciative of the Eagles while still keeping his eye on the Avalanche NHL prize. Francouz’s NHL debut proved to be a good step forward for the Czech goaltender. He played a solid game and showcased not only his skills, but his improvement. The Avalanche may have a good problem down the road – too many quality goaltenders and not enough space. Varlamov and Grubauer may want to start paying attention. There is another goaltender in the pipeline. In his own humble way, Francouz is knocking on the NHL door. All he needs is the opportunity. Francouz could very well be the Christmas gift that keeps on giving for the Avalanche.